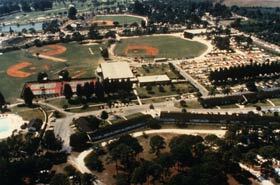 Where once baseball training and teaching was the only business at Dodgertown for two months, the O’Malleys had several year-round features that were successful, including golf, football, the conference center, 70 acres of commercial citrus growing and real estate (50-unit housing development called Safari Pines Estates). But as baseball goes, Dodgertown continued to be the initial proving ground for so many talented young players, including six National League Rookies of the Year under O’Malley’s reign, all looking to make a name for themselves and launch a career with the Dodgers. After Walter O’Malley passed away on August 9, 1979, just 28 days following his wife Kay’s death, the Dodgers and Dodgertown continued to thrive and develop under son Peter’s administration. Mr. and Mrs. O’Malley missed the violent effects of Hurricane David which damaged the press box at Holman Stadium on September 3, 1979 and the first year of a Vero Beach Dodger team in the Florida State League in 1980. But, there was also time to remember the past. The tradition of an annual Memorial Mass, initiated by Kay O’Malley to commemorate those individuals who worked, or were guests, at Dodgertown through the years are remembered by name each spring. It is a way of honoring not only the memory of the departed and their contributions, but what Dodgertown has stood for since it came into existence in 1948; namely family. And perhaps, a little slice of heaven on earth. Modernized and developed by Walter O’Malley and later by his son Peter, Dodgertown remains the state-of-the-art spring training home of the Dodgers. 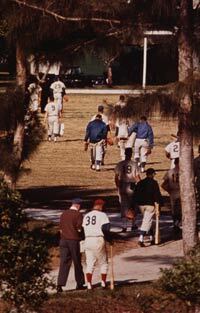 William P. Schweppe, Director, Minor League Operations and Monty Basgall, minor league instructor (foreground l-r), with players walking off the field from a camp game and heading back to the main building at Dodgertown, the end of another day in spring training. 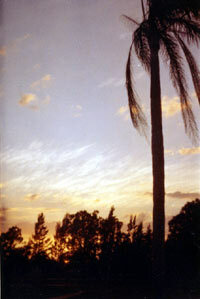 Sunset at Dodgertown completes another day of baseball workouts and the start of the season is one day closer.